Did you know that you can palettize with a Robot in your freezers? We are about to officially launch our new Palettizing Robot. At the beginning of the crab and lobster season 2017, our team put our latest innovation to the test in real production. 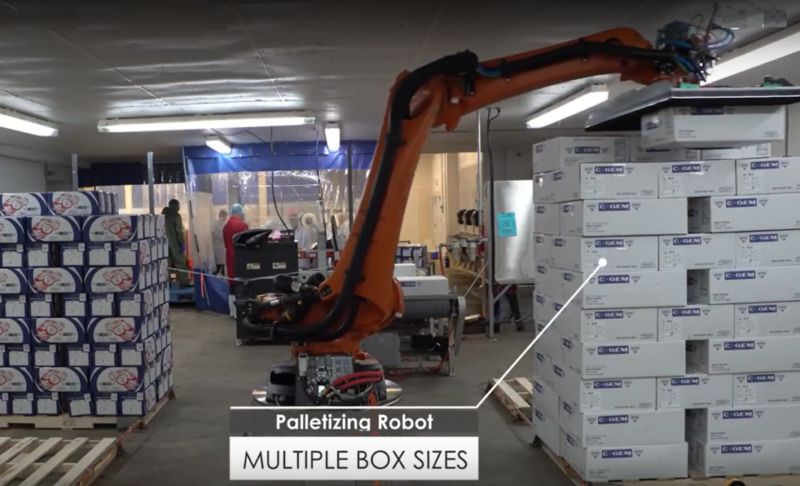 This robot can also be tied with our Smart Factoree Labelling and Traceability module to get paperless, box per box, traceability with no effort! This greatly simplifies the palettizing process and the paperwork around the different food safety programs. Cube Automation is the leading Seafood Automation company in Eastern Canada and we keep on innovating. We are located in the hub of the Seafood Industry in Canada. There are more seafood factories within an hour drive from our office than anywhere else on the East Coast. Do not hesitate to contact us if you want to know more.